[label]: Interior view Lake Oswego Public Library. Stanton, Boles, Maguire, & Church Architects. [display caption]: The 7,000 sq. foot library was dedicated on May 27th, 1962. [stamp]: Photo - Art Commercial Studios, 420 S.W. Washington St., Portland 4, Oregon. Phone 224-5665. IMPORTANT: Record this number 343087-3. To avoid delay in securing duplicates use number above to identify this photograph. Picture taken by architect, Jan. 1964. Description 706 4th St. Pinholes. 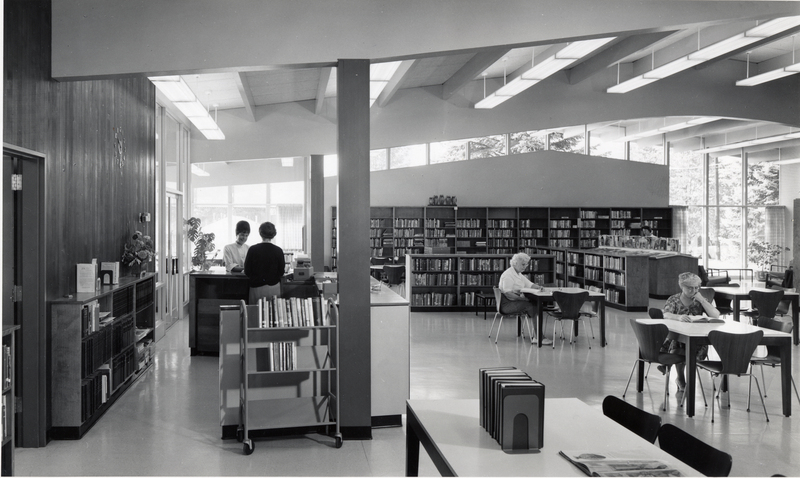 Transcription [label]: Interior view Lake Oswego Public Library. Stanton, Boles, Maguire, & Church Architects. [display caption]: The 7,000 sq. foot library was dedicated on May 27th, 1962. [stamp]: Photo - Art Commercial Studios, 420 S.W. Washington St., Portland 4, Oregon. Phone 224-5665. IMPORTANT: Record this number 343087-3. To avoid delay in securing duplicates use number above to identify this photograph. Picture taken by architect, Jan. 1964.